Plan a more strategic promotional campaign with promotional planners from ePromos! These office accessories are the perfect tools for any organized office worker or business professional; put your logo on them to raise awareness for your brand or solidify existing business relationships with current clients and employees. These imprinted planners are used on a daily basis, ensuring that you'll always have eyes on your logo or message constantly. Recipients will be reminded of your thoughtfulness and penchant for practical gift giving when you invest in useful, professional corporate gifts. Whether you need basic, small pocket planners to hand out at large events or you need a few of our upscale options for a more targeted approach, ePromos has everything you need for your business to succeed. Start browsing to begin developing a new game plan today! Keep your marketing campaign on track with these custom planner. This custom planner features one month on each two-page spread. This large promotional planner keep your logo visible month after month. Many stock designs are available with this Full Color Custom Pocket Planner. Choose the one that's right for you! 16-page full color custom day planner designed specifically for tracking medication in mind. Keep your marketing campaign on track with these custom planners. Classic custom pocket planner is compact perfect gift any time of the year! 16-page full color custom day planner designed specifically for women's health planning in mind. Soft Sewn Weekly Custom Desk Diary - 17" x 11"
This custom desk diary is sewn for a rich look and includes metal corners. This Ready Reference monthly custom planner is the perfect gift any time of year. Imprint your logo or a special personalization on this planner and employees will be very grateful. The Spiral Custom Monthly Planner is a must for staying organized all year long. It stores your most important information in an easy, compact way. These 14 month custom pocket planners keep your logo visible month after month, and a pen handy at all times. Weekly Custom Pocket Planner w/ Matching Flat Pen - Two Color Insert - 3.75" x 6"
These 12 month Weekly Custom Pocket Planners keep your logo visible week after week . Weekly Wire Bound Custom Desk Diary - 5" x 8"
Keep your marketing campaign on track with these pocket custom planners. Mid Size Matra Custom Weekly Planner with brilliant white paper printed in blue and gray ink, accented with gray ribbon page marker. Keep your marketing campaign on track with these pocket monthly custom planners. These custom pocket planners keep your logo visible month after month starting from December to January of next year. This monthly custom planner is functional and flexible with a 14 month calendar - makes a great holiday gift. These Mini Weekly Custom Planners keep your logo visible week after week, and pen and pad handy day after day. This weekly custom planner is functional and flexible with a 56 week calendar running December thru December. These 14 month promotional pocket planners keep your logo visible month after month. Starts December through January of next year. These 14 month planners keep your logo visible month after month. Starts December through January of next year. These 14 month custom pocket planners keep your logo visible month after month. Starts December through January of next year. Monthly Academic Year Pocket Custom Planners keep your logo visible month after month starting from July to September. They say that "the best laid plans of mice and men often go awry." But it doesn't have to be that way when you invest in ePromos' logoed pocket planners! One of the best ways to become a household name is through continued exposure to your audience. By imprinting your logo on any of our promotional planners and giving them to prospective clients, you're inserting your company into their daily lives, becoming a helping hand by keeping them organized and prepared. Our affordable bulk pricing options means that any marketing budget can bring larger quantities to hand out at big trade shows and expos, networking events, company picnics or even as holiday gifts or as a token of appreciation on special occasions. When you incorporate promotional day planners in your gift bags, you're telling recipients that you value their professional life and that they can count on you to stay organized. Twelve- and 14-month planning calendars come in several sizes, from something small enough for your pocket up to 17"x11." 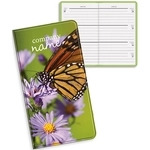 ePromos stocks nearly every type of planner imaginable: monthly, weekly and a year-at-a-glance. We also carry planners for the academic year and special planners for conferences and trade shows. All are available in vertical and horizontal formats. Plus with so many customization options, styles and colors, you'll find a treasure trove of products that fit well with your branding needs. So start browsing our inventory now to get started. Our graphics specialists are always here to help you through every step of the customization process. We'll help you to be the best by planning your success!